This is quite an old story, but I somehow missed it completely when it first ran, and I know that I’m not the only one that did – there was some discussion on the forums about it earlier this week. You won't be playing this or any other Wii games in HD on the Wii U.
It’s right up there in the title – the Wii U will be fully backwards-compatible with Wii games, but it won’t enhance their graphics in any way. No forcing them to run in HD, no anti-aliasing in games that didn’t use it, no improved texture filtering – not even simple upscaling. They’ll play exactly as they did on the Wii (except when a game offered the control option of a GameCube controller – that’s gone, too). Nintendo may choose to re-release some of their bigger Wii hits like the two Super Mario Galaxy games or the Metroid Prime Trilogy as enhanced HD ports (possibly taking advantage of the Wii U’s new controller, like the New Play Control re-release of Pikmin did with the Wii Remote), but it’s certainly disappointing that we’ll have to pay the price of admission for these games a second time – if Nintendo even choose to re-release their games at all. You may be aware of the emulator Dolphin, which is famous for its ability to run many Wii and GameCube games in HD. I took the above screenshot with it, and we have a thread on the forums dedicated to gathering more of them. Browse through it if you want to get a look at what could have been. What a pity. The screenshot above looks so pretty. looks the same as on my tv, how does it look better? But…how could it improve the graphics of a game that’s already made? It would have to be made with those graphics. Come to think of it, how DOES dolphin do it? This is simply to insure 100% backwards compatibility. If Nintendo wanted to render every Wii game in HD to insure 100% backwards compatibility they’d need to create a customized emulator for each game otherwise issues may occur making a game unplayable. It quite frankly isn’t worth the effort. While that’s not a good thing, if we have dolphin, then why even complain. Just set up dolphin on your computer and you can play Wii in HD without having to buy an entire console. this was confirmed at E3 like a age ago by reggie in the g4tv interview…. he also said the wii chip set was still there..
Oh well, there’ll probably be even better Mario games coming to the Wii U…..hopefully. And as stated above, they may just re-release their big-hit Wii titles for the Wii U……I know I would buy them again for the awesome upgrade. Would you rather have 100% compatibility that lets you play the games perfectly as they were made to, or not 100% compatibility so that some games can be rendered in HD? Nintendo have always been about quality over things like graphics. While great graphics are …well great, quality comes first and that’s what they’re favouring in this case I’d guess. Nintendo wouldn’t throw quality away for eye candy. If you’re looking for business plans like that you’re looking at the wrong company. This doesn’t sound like a big deal honestly. Firstly, I don’t want the Wii U to be any more expensive than it’s going to be, and secondly, with all that 3rd party support and whatnot (plus brand new Nintendo games in HD) do you think I’ll have the time (or even make time) to look back at Wii games? Heck no! It’s not like I didn’t play through them in SD the first time and got used to it. Nintendo doesn’t owe us this, so I’m perfectly OK with it. If Nintendo includes something like that without altering costs then I’ll take it and try to use it. But I don’t really see myself going back to playing Wii games much on a system that will bring such a robust launch lineup (allegedly) and incredibly immersive controls. Oh! C´mon! There´ll be more awesome Wii U games! JUST LOOK AT THE WII WITH THE GAMECUBE, SAME THING, GAMECUBE GAMES DO NOT HAVE THE GRAPHICS OF A WII GAME. Sorry for the caps, but I think it´s an important point. You don’t get the point, do you? Resolution (1080,720,480,360,240) and graphics are completely different. Besides, the Wii has *slightly* better graphics than the Gamecube. People, isn’t it obvious that they’ll not run in HD? I mean, they weren’t programmed to be in HD, only 480p. This ant really a big deal, if you really want HDMi on normal wii games just get the VD-W3. boom!! problem solved. 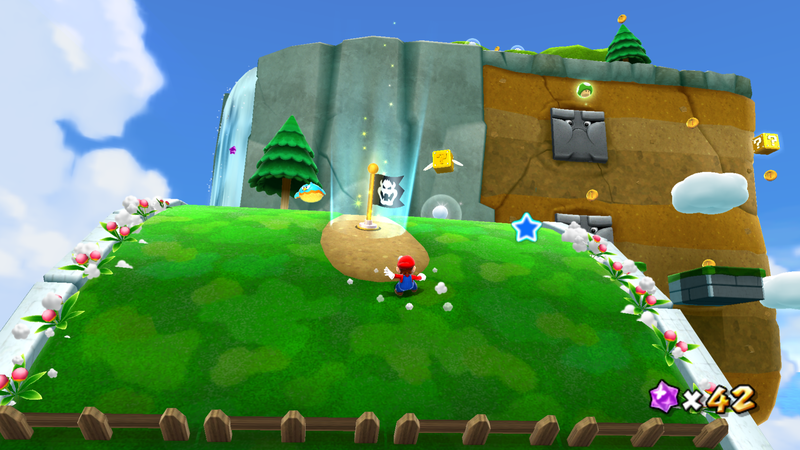 The Wii U will play Wii games on the highest resolution available for that game. Which is 480p or 480i. WHAT! I wanted 2 see Galaxy in HD! !